Joy Creek Photo Archive (c) all rights reserved Mexico. 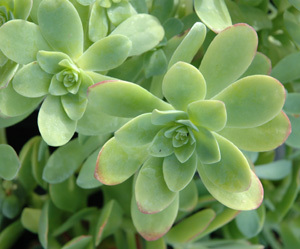 Sedum palmeri produces pale, dusty green, succulent leaves with a pale pink blush. The stems are upright at their bases and then become lax. Relatively large, point-tipped, starry flowers appear quite early. This is an ideal plant for a trough or container. Ray Stephenson in "Sedums: Cultivated Stonecrops" suggests using it in a hanging basket. Late winter. 8 in. x 8 in.